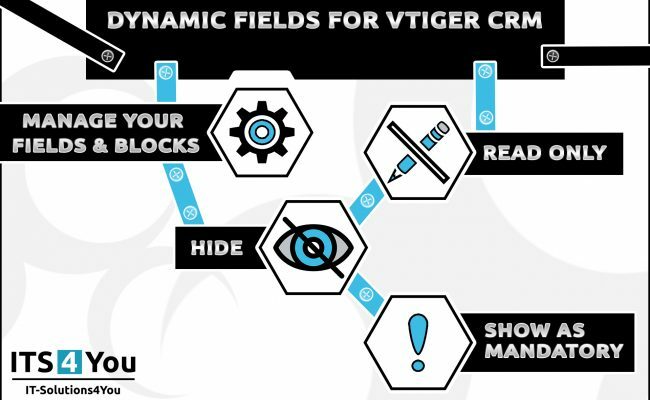 Extension that allows you to make your Vtiger form more dynamic and user-friendly. Dynamic Fields 4 You allows you to modify your form – fields in form – based on conditions like you wish. How does Dynamic Fields work? You are also able to set this value for each field separately or for each block at once. With membership/subscription you will have access to latest versions of extension for all vtiger version 5.x, 6.x, 7.x ( and higher). After subscription your extension will continue working without problems, but you won’t get support or updates. Duration of subscription is 1 Year.